#HeyEvan: Needing some advice. Have a friend who's husband was murdered and she was getting ready to file for a divorce prior to finding this out. She right now is struggling with feelings of guilt, shame and remorse. Could you help me with some words of wisdom and advice i could share with her. #HeyDesperate: What a tragic circumstance for your friend! I'm so sorry to hear about all of the devastation here. Seems like darkness has had a heyday. Your friend is blessed to have a friend like you. Most people avoid situations like this altogether because it's excruciatingly difficult to know how to be close in the middle of so much pain. Awkward is an understatement. So your friend feels guilt and shame because she had decided to divorce this man. Now she almost feels like it was her who attacked him. Traumatic. A few thoughts. First, let her lead. She may need to spill her guts (sounds like she already has), but she may also need to just have someone close by. I imagine she's lonely. The fact that you've reached out to me and to her already means you may be exactly who God has placed to just be there for her. Then the divorce thing. This is such an emotionally charged topic. Your friend feels shame for the failure of her marriage and for coming to that decision point, even without ever telling him. I'm sure your friend and her husband had been through some very painful times for her to get to that place. Sometimes the church is very helpful in these spots, sometimes not. I've worked through the divorce issue in terms of the Bible's requirements of believers. Again, emotionally charged and complex. I'm not going to lay out all of the theology and exegesis here, but let me tell you where I've landed on the issue of Christians and divorce. It looks like this. 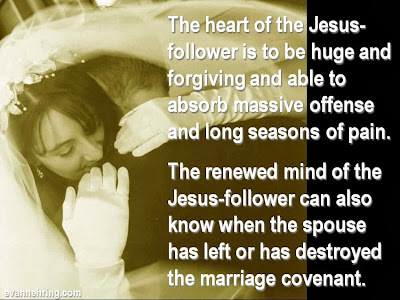 The bar for divorce is set very high for Christians. Adultery and abuse are two possible reasons, but there can be forgiveness there too. There's also forgiveness for your friend if she feels she was wrong. It's VERY safe to say she had nothing to do with her husband's murder. Pray that God would help her detach from any of that. That's the enemy. As she's able, she can find godly healing also in community, with you and with others. Jesus didn't shy away from desperate, hurting people. He went to them, just like you're doing.